Yes! Cleared the cache and it works fine! Wow. That is so much better and the articles ready so much easier!! What's your phone as I just looked at the site in my iphone 6 (Safari) and it showed captions. Yes! Looks amazing on my new monitor. So much content in one place, but very nicely presented. Feels clean and friendly. It appears to be fixed now! I was using a Google Pixel 2 XL on Chrome. I don't generally 'graze' the forums, so I had no idea this was in work. So after checking the site today at lunch while at work my first reaction when I clicked in a little while ago was 'Where the HECK have I landed?'. As some other's have said, this will take some getting used to, but that is not a bad thing at all. One thing I do particularly like is the larger images in the articles with captions tying them more closely to what is being said in the article. Especially when discussed details are now more easily visible. Looks Great, but I will miss the old site heheh. I hope when you upgrade the forum you don't use Disqus. Alot of forum's have switched to that over the years and it's totally awful. Oh my goodness, I just noticed picture captions and that when you click on them they display a full-sized image! Hmmm - I guess that my usage of the NSF home page is atypical. a) see if there is a new article - usually I see a ChrisB tweet 1st and view the new article from his embedded URL Plus I also have an RSS feed of the new articles. So this usage is low runner. b) My main usage of the home page is to refresh it to see the recently active threads and read the ones that I follow. I find this more useful than going through the forums page. Perhaps adding a way to get the active discussions list rather than staying at the bottom of the home page. So my main uses of the home page are right at the top and right at the bottom and it takes a while to scroll from one end to the other. Great work with the design. Everything is amazing. Only pointing out suggestions below to really top it off. 1) The About Us page is missing. Literally the only site contact an e-mail link ([email protected]? Who is that?) at the bottom. Previous site had a list of writers and a better contact list. 2) Yes, priority on the right hand side should be active discussions. The forum is a great part of NSF and the news site and forum are joined at the hip. It makes sense to have it above the page break. If not, it shouldn't be that ad words placement there. I'd swap active discussions and that adwords in placement. If you really want an ad there, do one for an online NSF store that's been proposed or a paying aerospace company. At least that would match the theme of the site. The adwords ads do not. Just move it down the right. Overall I really like the new design of the front page and news articles, it is much easier on the eyes and it makes for great readability. Personally I dislike the multi-page article setup though, I prefer to be able to just have it all at once, long read style. Yes I know the high res stuff is often found on the forums, but it would be so much better to be able to see them in a gallery with the news article! I love the new site! Very clean looking and in keeping with modern "flat" design principles. Will test it later on my 4K TV. The larger image format will finally mean that Nathan's amazing renders get the screen space they deserve. Just one request, and I know this has been discussed before, but a "dark theme" would be excellent. YouTube has recently implemented one, and it is so much easier on the eye, especially at night (images attached). 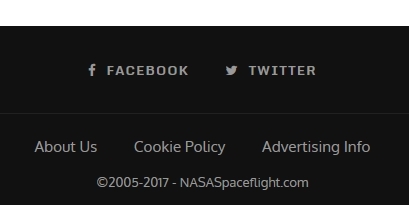 As a space site I think a dark theme would work well for us anyway. We heard you (all) :-) The dark theme and/or fine tuning the current theme is being evaluated. More news on this probably next week. Love it so far, but agree that the "Active Discussions" needs to be a lot higher up. Maybe swap with "Popular posts"
Great looking new site Chris but you are missing one very useful thing that other sites like Spaceflightnow have. You need a Launch Schedule button or link at the top of your main page. I used to hunt around Nasaspaceflight looking for advance notice of future launches to set my schedule but I gave up when I discovered that Spaceflightnow had one. I prefer to use your web site so if you could add one, it would be helpful and much appreciated. My vote also for a "Dark Theme Option" and "Active Discussion" at the top. I do a lot of night reading and it would help with the pain of changing the monitor settings back and forth. A couple of ideas to help? First; It might not be a bad idea to limit the data in the calendar to simply; Payload, Launch Vehicle and launch location. Date, time and other data can be gotten from the link to the forum that's linked in the calendar. Second; Putting the Calendar link on the main page would also be a good idea. It would allow people unfamiliar with the layout to access the info more directly, and still lead to the forums. Here's how the site looks in 4K. Wow. Normal PC, but on a 4K telly? PS I don't think I'd ever consider Doncaster! Yup, PC hooked up to a 4K TV. I use it for gaming and media, it's not really any good for general web browsing as most sites aren't optimised for 4K. And yeah, stay away from Doncaster. I hear it's almost as bad as York! I like the new site. Only gripe is that active discussion area now much harder to find on desktop and on a mobile device; REALLY hard to see. Thank you for all the hard work in updating the site. Works good in Windows 7 Explorer and on one of My PCs' for updated Firefox, my second PC Windows 10 Enterprise 64-bit doesn't like the homepage in Firefox (all jumbled/left oriented) and I get a 404 for the "recent forum posts" discussions. Tried playing with Adblocker on/off and deleting cookies. Nothing yet, will try clearing cache next I guess... Keep at it! We're absolutely going to have a think about active discussions placement. Let's get mega launch Friday out of the way and have a review. I liked it, but the mob has spoken! Now that I've been using it I too agree that discussions are too hidden. The first thing I look for when I come to the website is to see what everyone is talking about, so having to scroll to the bottom of the page to find out what the hot topics are seems to discourage discussions - which I know is not the intent. I agree about the difficulty in finding the forums. Just put some buttons near the top, or a floating control panel/menu. on s shared router, 15mb ASDL last mile copper..
then it follows on the right side as I scroll down through the rest of the articles..
Maybe show more than the 5 most recent forum posts. Some days, that buries stuff that may have been interesting. That screenshot is funny, as it has some content from the old site and the mobile theme from the new site. Something very wrong in your browser there. PS. HOW many tabs do you have open! My PC grinds to a halt when I go over six tabs. I lost count of how many on different windows... I believe more open windows uses more resources than tabs. Perhaps a RAM upgrade would help? We can start a go fund me page for that on here, I'm sure many will chip in! I followed a link here from reddit, and after a few minutes of reading I thought "wow this is really good content, I wonder why I've never seen this website before". Then I realized where I was. The only issue I see is with the "Pages" indicator at the bottom of lengthy articles. The blue box indicates which other pages can be navigated to, rather than which page the reader is currently on. This is the opposite of the way it is done on the forums, which is confusing. Otherwise the new site looks great! 1) Active Discussion placement on the right hand side. 2) Potential of a Dark Theme option. 3) Long articles with several pages (remember, it won't be all articles, just the really long ones) require more obvious page indicators. Do you use chrome? Open the new site in an Incognito window and see what happens. Yes, I have Chrome but I have been road-testing the new Firefox Quantum since it's release about a month or so back. Thanks for the incognito window idea, Ill give it a try... Cheers! Brilliant Kevin, thank you, it works in "incognito"! Is the new site "classified" or something? If that doesn't work then in chrome, right click and then Inspect, then click on Console in the debug window that shows up. - the info from the console can give Chris and the team (and the rest of us) info on what's not loading. I suspect you are either loading different versions (cache problem) or something is failing to load properly. there's something on your home page that causes my GPU on my laptop to running endlessly (and then the fans kick in and the heat builds up). Jumps to > 50% usage on page load and then settles down to around 18/20% continuous. This is Chrome on Windows 10. I will try on other browsers and see if it's the same. Do you also see this problem on article pages (any other as the homepage) ? Kevin, in Chrome site specific, try a "hard reload" or empty cache/hard reload: Good luck! Looks like the slider is misbehaving for some. Thanks for reporting, we will investigate (and fix) this! I like the new site quite a lot. Of course, I liked the old one as well. Elegance of form is wonderful, but it is the great content that keeps me active. I am not a "power user." Mostly I lurk, with just a few posts per year. But I visit the site several times a day. Minor point: I like the Calendar of upcoming events near the bottom of the Forums page; I think it would be worthy to move the Calendar to a "Coming Events" box on the main page. I understand that real estate there is at a premium, but a very readily accessible display of launch dates and times would be great for the lower- to mid-level users such as I. Thanks again for all you do. I consider my Life L2 membership very much a bargain. Can you try this again ? I made a quick fix/workaround which seems to drop the load a lot on my machine(s), can you confirm ? thanks for checking, this gives me good guidance to fix this. For myself, I could reasonably easily find everything i was looking for, and the *only* design element that was unfavorable is the "popular" bar right at the top. As it is high contrast, *and* the automatic changeover to next item on list is a very rapid scroll, it forcibly snatches my eye's focus every time it changes. Using a slower scroll, or using no scroll just a wipeover, or using a lower-contrast display, would alleviate this. I **love** the level of detail/info available on the mouseover heading tabs (under International and Other). It shows when article was created, region applicable, and a thumbnail with just the right size to see what it is about without clutter. Even the placement and identification of advertisements is quite acceptable. Is there a possibility for a "dark" theme, as some people (not myself) prefer to view in a dark room, and then the large amount of brilliant white background would be painful. Thanks for the kinds words! As said before, the possibilities for a dark theme are currently being investigated and this will probably have first results in the coming weeks. As an early Christmas present, a small peek on the on the dark-mode development. Please let me know if this is what you are looking for..
Looks great guys. Fantastic job. Do we get some new merch to buy? Can we still buy the old merch? I saw the "dark homepage" when you had it up earlier, looked nice! Am I missing something, or is there no longer a list of all recent articles? Looks great. Maybe a bit darker margin? That dark theme looks nice though. Any way for us to test drive it currently? (different URL)? Yep, that's exactly what I had in mind! Nice work. Congrats on a successful launch! Site looks great! It looks much better with the dark theme. A desktop mode to make use of larger displays also would be nice. Please don't do that! Or optional so we have a choice? Thanks. PS, Also makes the logo look worse, too. IMHO ! Optional definitely would be the way to go on it. A little more shading on the sides or even some kind of space themed background to add little depth and set it aside from other sites would be nice. New web pages looks nice but would it be possible to fine-tune the fonts? Like 1pt larger, heavier body? Both on Safari iMac and iPhone. I keep comparing with Safari reader mode and the reader mode seems clearer. Probably just my old eyes, sorry To give you an idea, attached a side-by-side screenshot of an article as shown in Safari vs Safari reader mode. Just noticed a spelling error in the browser titlebar when viewing the new homepage. Looks really good Chris. Thank you Mark! Here's what it looks like on my Chromebook. Working my way thru the new features. Great stuff! And to all, we have final placement for the articles. Note that the ones you see in Chuck's screenshot at the featured (main) articles. As per the old site, we have "secondary" articles, used - for instance - when there's three events at the same time. So last night was SpaceX launch - featured. The secondary articles run under "Latest News". They all have their own sections, but that ensures new articles are easy to find. Most articles are featured when we run them, so that's why there's only the need for the two article secondary placement as it's pretty much just for when there's two or three stories in the day. This might be interesting reading. There is a lot of magic you can do with image caching... if applicable it can reduce the load on your servers as well as the load on everyone's browser... Most NSF images once posted would never change I think? so really long time to lives might work well. I don't know (and don't want to know) NSF internals well enough to know if this might apply here but thought I'd toss it out. The only images that would change on the news site tend to be launch articles and events, where it's pre-event/launch, post-event/launch. (Including things like RS-25 tests and so on). That looks really nice. Could we also get a pure black option? Pure black backgrounds with white text look amazing on OLED. I’ve attached a picture of the reddit mobile client Apollo in regular dark and pure black modes. Could we also get a pure black option? Pure black backgrounds with white text look amazing on OLED. Just as long as it isn’t the only dark option, because straight white-on-black looks terrible on CRTs (we’re still out there!). A non-computerization question--- When will the NSF merchandise be re-done? Or can we still get the old stuff? I've put on a few pounds and need a larger-size sweatshirt! 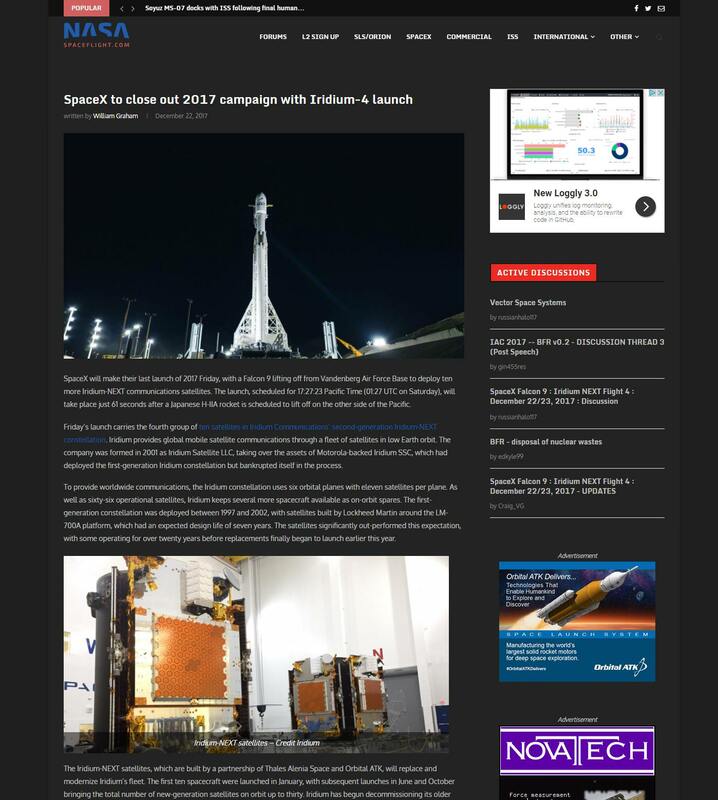 However these links don't go to a specific article with details about the specific event mentioned as the reader would assume, but to a landing page which lists everything tagged "Dragon" or everything tagged "SLC-40"
The latter is a page that lists a limited number of articles matching that tag, starting with the newest. But the oldest SLC-40 tagged article is from 2013 about CRS-3. None of the articles from the time mentioned, when SpaceX first leased and transitioned SLC-40 is actually tagged "SLC-40". As such, linking the tag list is completely useless. The link to the "dragon" tag is even more useless. There are really a large number of "dragon" tagged articles, so the list page is actually paginated - in a bad way, one needs to scroll down all the way to see a link to "older" articles. and the oldest Dragon article the above mentioned one from 2009. There is no detailed info about SpaceX private development prior to the NASA contract as one would have assumed seeing the link text. Interesting thing is, reading old articles that predate the tagging system, they are also full of links, but in this case these links mostly link to individual and highly relevant articles. It's only at a later point that someone got lazy and assumed linking to a tag search result is a viable substitute to looking up a specific article URL from the archive. Bad news: It's not a viable substitute, it leads to user frustration when they can't find the information they expect. Tags are nice for a "tag cloud" so a user can look up everything related to X. But linking a tag is pointless, one would have better results putting the link phrase into google. Of course to fix this, the authors need to search the archive to seek out the actual article links, which can be tricky, especially if the archive is large. Tags could make this easier, but only if one can narrow the search by also specifying the timespan in question. And also only if someone ever went to the trouble and updated the tags of older articles where applicable, especially as new tags get introduced. Added it here as it's the right place. Yeah, that's not the fault of the site, more to do with the editor (i.e. me as I add the links), as I've found giving the read a lot of resources is better than a specific article link, as much as we do use such specific links a lot. Also, for the interim, that's my best option as the old articles are ported and not in the style we are now using. Eventually, as more and more new style articles are published, I will be at more liberty to link to specific articles. Also, probably a bit of lazyness on my part as it's a lot of work to get an article from text draft to published with pics and links, and long articles can result in "I'm running of out of time here and we're mentioning Dragon again, let's just link the Dragon articles and give the reader the option of what they want to read about. Potential mid-solution is to use tags less and use more of the search string link, with multiple words to refine the articles the link sends you to, so I'll do that.......but the new style needs to bed into the article range of course. which gets it down to 9 pages (that's good! ), but most are not actually from 2009 but only list any date or link with the number 2009 somewhere in it. I like that its possible to narrow the search by adding more search terms (with google it's the opposite) but a more specific search interface to search for combination of tags and terms and/or date spans -- as well as narrowing down a search result by tags and the like would be useful. and/or, the ability to see a tag cloud with all the tags and their relative prevalence within a search result. Which could then be clickable to narrow the search further. It feels like I'll get that if I go trough the "hero" roll (all of its pages) and then start clicking "load more articles" on "latest news".... but I'm not sure there aren't some OTHER articles falling trough the cracks somewhere in the other sections. Can you add an overall "view all" page? Something like "https://www.nasaspaceflight.com/news/all/page/1/"
Thought I give my feedback after a week or so of using a new site. It's slower compared with old site. I get that old site was Web 1.0 version and this one is modern one with mobile version included, but it really feels slow. Mobile version even more. "Active disscusions" section for mobile version is waaay down and requires a lot of scrolling and for me this is really importat section. If possible, I would move it up more. That section changes probably most and people probably use it most. Old grey/blue colour theme was better that this black/white and now is different than forum one. The main NSF page routinely throws a warning on Firefox, Mac, that a web page is slowing down my browser. I don't recall it doing so when the new front page went live, but it has for the last few days. If there is anything you'd like me to do to try and diagnose the issue, I'd be happy to help out. The thread for NSF in general is locked, so I posted here in the forum thread, sorry. Tater, moved it here as this is the thread now. Other one is just the forum (as that's a continuation), this is a new one for the news site upgrade. I find it nice and fast, but there is more work being done as there's things like refining the cache where it helps loading, but we probably went too far as I didn't see a change/edit applied when I edited it in. That live edit is solved now, but Mark is working a bit more on the CMS, so there's more cowbell options that may help you. By all means always diagnose anything you see amiss and add it to the thread! Bulkmail: The layout is my wishlist. Featured will rotate around the top per the timeline of publication. Secondary stories (as I inaccurately call them) move on the two spaces below the featured block. Scenario, where you come back after a few weeks, would be to check all the featured block, the secondary block and then "load more articles". <---that totally covers you for all the secondary stories per several weeks. Most featured articles here will be SpaceX, SLS, Commercial - and the blocks of five further down the front page will host probably about a month or more worth of articles for that subject block. The only ones you may miss, if you went away for a long time, would be a featured article, not from a major block, published just after you left. So hmmm, that I'll have a think about. The vast majority of readers come back every day, if not every few days, so that's how I knew we'd be covered, but yeah, I'll think about some sort of RSS feed timeline (either a standalone link, or added to the forum) where you'd come back and see a list of article links covering the past month or two. That'd solve it all. I would like to see a list of articles by date. I don't want to have to search through the the whole page to figure out what articles are new. I agree. It would be better if the "Latest News" section had all articles in chronological order including the SpaceX ones. I think both of you missed my post directly above yours. A minor possible improvement: It would be nice as a recent L2 subscriber to not be shown the "L2 Sign Up" Top Nav item everytime I hit the homepage. Not sure if the main site tracks the same logged in user as the forums do (I'm guessing not? ), but perhaps a cookie could be used to distinguish an L2 user to remove this redundant Top Nav item? For L2 users it could perhaps be moved to the "Other" section in case L2 users want to review the L2 Signup page - to perhaps send it to a friend! Second piece of feedback: Where's the About (https://www.nasaspaceflight.com/about/) page linked from the home page now? I expected it perhaps under the "Other" section and also/instead in the footer, but I can't seem to find it. I had to google it to find it. Those tiny niggles aside, the site redesign looks awesome! Oh another thought: Any chance L2 subscribers get to view the main site ad free as one of the perks? Again it would require the main site to track logged in user status among other things, but would be a nice perk if doable and not overly costly in terms of lost ad revenue. Apologies if this has been brought up before, and you're answering this for the umteenth time. I am still not clear on how this whole secondary article thing is useful. In my opinion, it is making things way more complicated than they need to be. Really, all you need is dynamic control of the arrangement of articles in the headline boxes at the top. Think about it like this. On December 22nd during the launch mayhem, the average order of interest in a user coming to the site was Iridium, followed by Japan, and then the China launch. 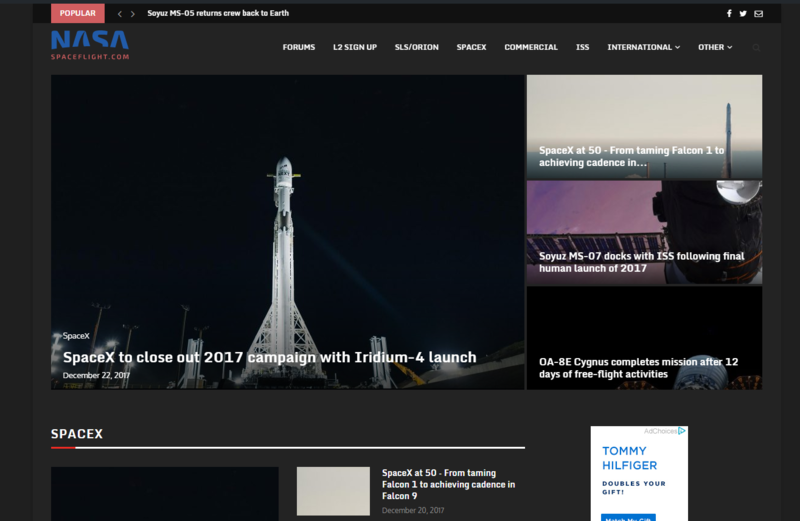 In reality, the site instead had the Iridium article front and center (good), and then had the less hot Cygnus, MS-07, and SpaceX at 50 articles (bad) featured along side it. In my opinion, during that time the Iridium article should have been in the main box, and then the smaller boxes should have had Japan, China, and SpaceX at 50. However, the this was not possible because the site was categorizing articles based on their long term importance, rather than the short term importance. By the next day the hype for the China and Japan launches would have died down, so you could have gone back to running the Cygnus and MS-07 articles at the top. The internet is very dynamic. What people want changes rapidly. The "featured" articles system should be flexible rather than rigid. The current system does not allow for this. Additionally, the latest article section is confusing. If I see something called "latest articles," I am expecting to get a list of all recent articles. Instead, I get a list that only has the less exciting secondary articles. You are making the recent news too boring! A good example of a site that puts this all together is https://electrek.co/. They have a flexible headline system. Whatever people are the most interested in goes at the top. Then, below that is a list of all articles chronologically. I think you should consider doing the same. Now, NSF does not post as regularly as Electrek, so I think it's good that you also have the SpaceX and Commercial Crew sections below the latest articles. That helps the people who only care about SpaceX (and there are a lot of those) find their meat. TL;DR - Basically just have normal articles and headline articles. If an article is about a hot topic, headline it. Once it's done being hot it becomes a normal article. All articles go in the latest articles section no matter what. 1) Hey, I'd be totally cool with L2 members being able to custom remove ads or anything, they've totally earned it...but yeah, as you note the news site and the forum are two different software bases. Not sure if a cookie would do the trick. Only way I could see it working is if you logged in from the news site and went through to the forum *thus the news site would see you as a L2 member*. Maybe for the future, but it's a bit over my head per application. More so for the L2 button as that - and the top bar - are literally like the paint on a wall, as opposed to pictures you can move or remove. 2) The news site is absolutely right (at least in how I envisioned it) and I'm wondering if we're all talking about the desktop version? The desktop version (and I can't see how the mobile version wouldn't be) are in two-phase chronological order. Per the Featured and the secondary blocks (all above the page fold). You'd need to be off the site for nearly a week or more, to miss a new article as you load the page, and in order. If there were more than two secondary stories, you click load more, again above the fold. The question was for someone coming back after several weeks away (which is a small amount of people based on the stats) to which a solution may be a forum thread in General titled "January NSF News Articles" and post the URLs in the opening post as we add the articles. HOWEVER! There's the ticker at the top of the news site "Popular" which may be working on most reads, which we could simply change to ensure it was actually that newest to oldest list of the latest 20 articles! Booom! Overall, per the new site, the trick is the balance as we could create a site that made you a cup of coffee as you entered the site and starting reading articles, whilst giving you a bad rub and a few people would say "But I don't like coffee!" I really expected a lot more of the "I don't like what most other people like" so this is good. We seem to be mostly "like it" and a few "refine a few things" and pretty much ONE "hate it!" That's a good result! "Contact" is wrong. It links to an e-mail address. Needs to link to the previous "About Us" page with more contact info. Store. Because I want a NSF laptop bag. Continued utilization of the extra cowbell we have in articles. Chris G hit the ground running with his Year In Review articles and found more coolness. Caution is not to go overboard and ensure it remains focused on the content and not "fancy gifs". Other drives are more to do with me as editor getting more writers in and so on. Next phase of server improvements is next. Something you guys won't notice other than how long time members will have noticed the days of "Bad Gateway" when someone sneezed SpaceX are long gone (Falcon Heavy is going to be a real challenge, however). Then we work on bringing the forum software up a notch or three WITHOUT losing familiarity or ease of use. I've seen some sites completely change their forum and you're left shaking your head thinking "Why???" Yes, we have to upgrade, but man that will be a massive community crowdsource and discussion to get it right before we even think about changes. Looking forward to the "dark mode" being launched. While the new front page looks nice, there's too much bright white space for my tastes. On the subject of layout, any possibility of a "list mode" in addition to the current "grid mode"? Go over and look at the options for the ArsTechnica front page to see what I mean. Beyond that, good job, looks nice. The only other gripe I had was active discussions being below the fold, which you've addressed. That's now good, per the bottom of the page. Was previously just "e-mail" and now it's proper about us and contacts. Well I've mainly searched used "Tags". We probably could use that tag box back if it doesn't add much load. If it does, it might not be worth it and we can use direct tag links in articles and the forum. However, while they still work per working URLs, there's the Search Function, which is far more standard for news sites. That works, but I've noticed new articles I've added since the new site went live going are displaying in full, not in brief (like you see in the front of site). I bet that's literally a line of code Mark needs to refine. Not relevant to the front of site, so it can wait until Mark is back. At the same time, those "groups" of articles displayed after entering from a search are *not* in chronological order! That obviously needs to be changed and I bet that's again just a line of code for Mark. Just posting to say I'm aware and it'll be sorted out. Both are minor. From an editorial standpoint, I've got to say it's a lot easier to create the articles now. Before I would be running around spending a lot of time trying to find images that would fit the article. Now pretty much any large size image will work. Also allows far better breaking of paras, without actually breaking the paras with a line break. Now large images, twitter embeds and so on do it. Really is a big improvement. Serious question Chris and not a joke from what you wrote above but it is the question I have..........Why? The forums are the absolute best forums I have used anywhere and are using currently. Just curious as to the driving reasons for the bold part above. However, while they still work per working URLs, there's the Search Function, which is far more standard for news sites. That works, but I've noticed new articles I've added since the new site went live going are displaying in full, not in brief (like you see in the front of site). I bet that's literally a line of code Mark needs to refine. Not relevant to the front of site, so it can wait until Mark is back. Silly me. I've fixed that as the new site was reading the ported articles over with the "abstract" link we put in, which I didn't think we needed for the new articles. Putting that back in (you don't see anything different in the article) fixes that issue. Boom! Call me a web genius. Ok, perhaps not But that's that one fixed. Time order for searched blocks, will check if that also fixed it, but if not, will let Mark know. Have to move on with the technology. But as previously noted, I've seen some sites die by making massive changes. Trick is to keep things familiar. Will be the biggest effort, but one where we really get the community involved with both technically and via discussion of how to do it. Chris, your caution and forethought are appreciated. I'm on several partner forum sites for software and services I use professionally, and I've held out NSF as forum-done-right in those venues. This made me think to check it on my slowest device. One thing that I noticed is that the images actually load long before the headlines, which is less than ideal. Also the back-to-top button is a bit glitchy – is it really needed? And what system/browser did you have this experience? Actually, both problems seem to have resolved themselves – I’m unable to replicate them. I’m now guessing the images-before-text was probably just something to do with the horrible packet jitter I’ve been getting lately. I’d still prefer getting rid of the back-to-top button, though. Even when it’s working, it’s just annoying. A minor problem I've encountered is that for some reason the image captions don't work/show-up for the first picture of an article. They work in all the subsequent ones but never in that headline or lead picture. I'm browsing in Firefox 57.0.3 on Windows 7. Yeah, that's been like that from the start. Captions only work for images in the body, not feature section. Really not a big deal per the main function of a caption, which is to describe the picture. The lead image will always be obvious and the headline will likely be its caption. I guess I wasn't thinking so much about the "what" in the picture but more the photo's attribution/credit. The changes are great! Love the new iconography and logo. I would love to see the favicon for the forums updated to match the website; right now it still uses the old logo. Great job Chris and team! I personally find GIFs inline with articles extremely distracting. So much so that I have a hard time reading the article when the GIF is in frame. This may be unique to my own less than perfectly functioning brain and if it is uncommon then I certainly don't expect anything to change on my account. Does this bother anyone else? The most recent Cygnus article has such a GIF and there doesn't appear to be a dedicated discussion page, and this certainly isn't related to the vehicle so I hope this is the best place to put it. Please ignore me and/or delete this if it is not appropriate or it just comes off as whining, but I thought it was worth mentioning if others feel the same. 50 second reboost test burn confirmed for the OA-9E Cygnus! First time a US vehicle has conducted a reboost since the Shuttle era! If they bother you that much you might want to look for a good gif blocker browser extension. I used to have one that would just play the gif once unless you clicked on it to play again. Much less distracting.